/ Can the CatIt Senses Food Tree Slow Cats Eating? Can the CatIt Senses Food Tree Slow Cats Eating? Cats can get overly excited when it comes to feeding time and therefore, eat too fast or overeat. This can result in vomiting after eating or cats getting overweight. One way to help your cat from eating too fast is to use feeding bowls that are designed to slow cats eating habits. The way they do this is to create puzzles that your cat needs to solve before getting to their food. Or mimicking hunter and prey behavior by making cats paw their food. With regards to the CatIt Senses 2.0 Food Tree, this is designed to hold kibble which your cat has to paw. 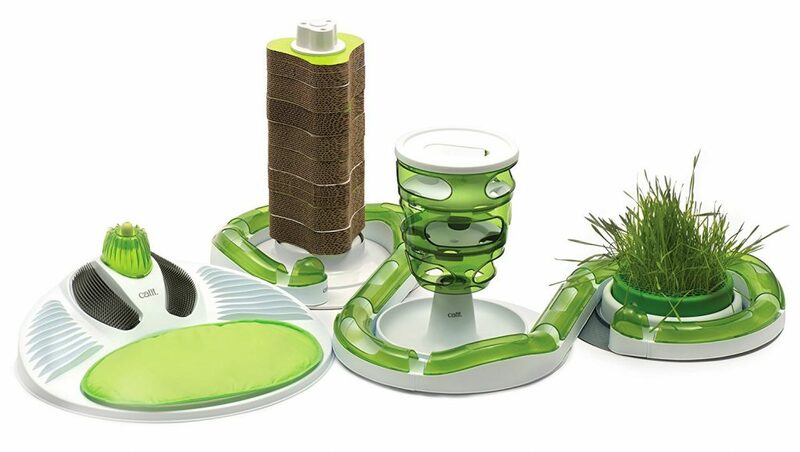 The CatIt Senses Food Tree is based on the original CatIt Food Maze but it has undergone several design upgrades. It also works in conjunction with other items in the CatIt Senses 2.0 range such as the CatIt Senses 2.0 Super Circuit. Thus making an all in one activity area for your cats. Quite simply the food tree has several layers. Kibble is placed in the top layer and your cat then needs to move the kibble or treats from the top to the bottom of the tree. They do this by pawing through the side openings. Once the food has hit the bottom level it then drops down into a food bowl. Therefore, it then takes your cat longer to eat their food and it makes them work for their meal. This provides stimulation, especially for indoor cats. 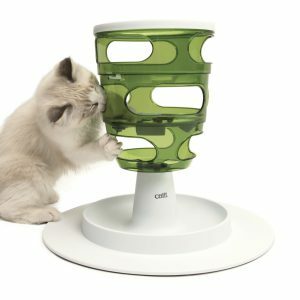 CatIt has also taken the design of this feeding station one step further by making sure that the feeding bowl itself is whisker-stress free. Often cats do not like items touching their very sensitive whiskers and often food bowls are smaller and deeper which results in their whiskers touching the sides. In this case, we have a shallower feeding base which is much wider than a standard food bowl. As well as dried kibble you can also use the food tree for treats or even small ball toys. Either will allow your cat to use their natural pawing behavior and give them a good stimulating play session. But, pop in your cat’s dinner and you can see that this will now slow down their eating. To keep kitty interested and constantly learning new tricks, the CatIt Food Tree also comes in three levels of difficulty. You just need to rotate the middle disc on the tree to adjust the opening sizes. Can Your Cat Knock the Food Tree Over? The current version of the cat maze has been designed with a new broader, stable base. Which makes it very difficult to knock over. Also, due to design changes from the original maze, the top opening has been reduced in size. This is to prevent clever cats from cheating and directly accessing their kibble. 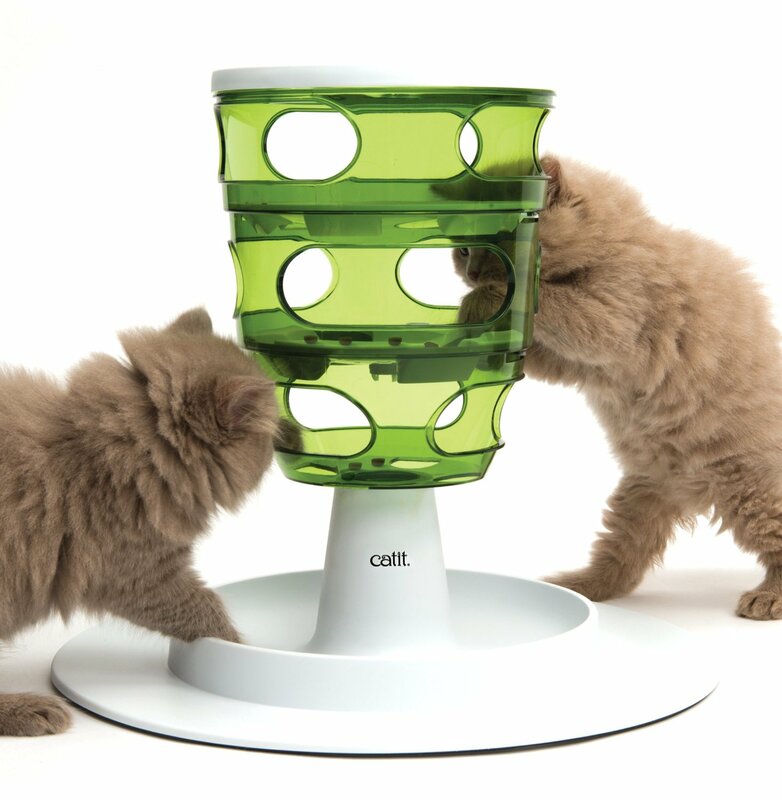 Overall the CatIt Senses 2.0 Food Tree does help slow down cat’s eating. And it can be used for kittens as well. I found with my kitten that she had been in a very large litter and was, therefore, trying to gobble down her food straight away. Food was also being flung all over the floor. With the food maze though she is having to think more about how to access her food and it is now not disappearing in under 5 minutes. Being naturally playful it is also giving her a fun workout as well. This is also perfectly usable by larger cats as the holes through which they paw the food are a large size (about 5.5 by 1.5 inches). So even a cat with the biggest paws should be able to use this easily. If you have other CatIt Senses items such as the Super Circuit then these can all be linked together in one area. Want to see more on the CatIt Senses Food Tree? It is currently available here from Amazon. This is a colourful and attractive toys and feeding trough for cats. I would definitely love to buy one of these.